LGBT Labour - The Labour Campaign for Lesbian, Gay, Bisexual and Trans* Rights is a socialist society affiliated to the Labour Party. Members include trade unionists and members of the Labour Party. LGBT Labour is democratic; our members make our policies. 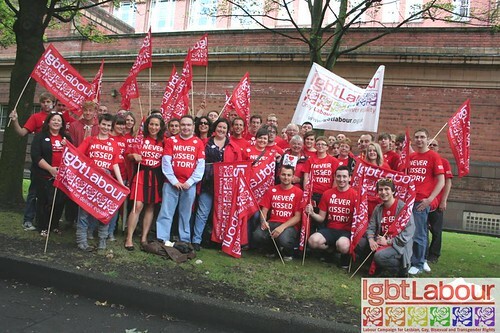 Membership is open to any lesbian, gay man, bisexual or trans* person in the Labour movement. Supporting membership is open to others. LGBT Labour campaigns for full legal and social equality for lesbians, gay men, bisexual and trans* people. We are active in the Labour Party, the trade unions and other labour movement organisations. LGBT Labour is proud of Labour's achievements but is campaigning for further steps towards LGBT equality including equal access to marriage and civil partnerships, promoting LGBT people in public life as candidates for Labour and campaigning for equality internationally. For general info, email us at the address below. Alternatively, please call our voicemail number or use or address below and someone will call you back as soon as possible. For Press enquiries, call our Co-Chair Ian Thomas on 07809129412. If you are a member and want to come along to one of the meetings then email Matt Day our Secretary.